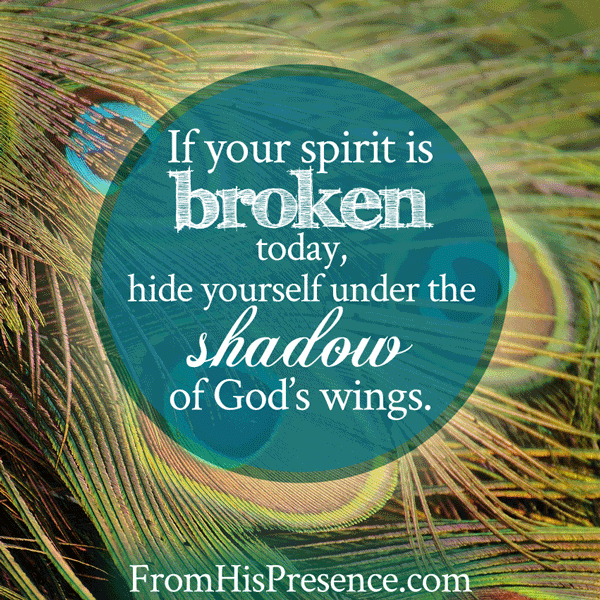 The Lord told me today that some of you have a broken spirit. If that’s you, I have an encouraging word for you right now. First, I felt like the Lord wants you to know that, in the long run, it is going to be okay. YOU are going to be okay. It’s just a matter of getting you from here to there. The battle is too strong for you, but that doesn’t matter because the battle is the Lord’s anyway. Take this time to hide from the battle under the shadow of Papa’s wings. The Lord shall fight for you, and you shall hold your peace. Physical and spiritual fatigue can only work against you. Get lots of sleep, and make a point to refuel in God’s Word. Remember that the words that Jesus speaks are spirit, and they are life. Fill yourself up with Jesus’ words so that His words can repair, heal, and give life to your spirit. The Lord told me to tell you to rely upon His divine energy, not your own. There may be times when you feel like you are aupposed to be doing something productive, but you just don’t have it in you to do it. That’s okay. If that’s you, revert to step 2 and rest. But when Father is ready for you to do something, know that He will give you the divine energy to do it. Rely on Him, and follow His voice. Reduce your expectations of yourself to simply following His voice. Then, you will not wear yourself out and you will have peace. I am praying for all of you who have a broken spirit today. May our Father and Comforter demonstrate His own love to you in many ways today, in Jesus’ name. I praise God for blessing and encouraging you, Diane. I just prayed for you. your word is for me and all your teachings for me! I’m a born again spirit filed christian .the call is on my life. From mom dying at age 9, dad alcoholic God radically save me at age 28. I was married 25 yrs and 4 kids,a family I never had till 2007. Some issues can happen in life, marriage I was faithful. Suddenly she left no notice. 7 years ago enemy got in. A husband and fathers nightmare I was in shock. my character, poison to kids all of sudden try to take teens (3 girls) from me try to repair, forgive change and 2 yrs no hope. I was accused in shame, my testimony used against me, and all sorts of nefarious accusations, was could never imagine this would happen to me , my family. God vindicated me and she found in the wrong, had joint custody for 2 yrs , could nt see much no cooperation. I stand in forgiveness to all and God to bless her, she remarried 1yrs after our split.Very hard on my kids, marriage is forever.My youngest Becca (23) been ingrained with mistrust, bad words from mom wont reconcile, don’t see much only holidays, lives 10 min away. She getting married in 10 mths, question as to walk her down the isle.. she not want to. I would Crush my heart , I’m her father raised her and love her. be a blessing in honoring me and her too.Brought her up in God 25 yrs, with her every day of her life, close. Wall there, i very hurt, praying for7 yrs healing reconciliation. The pain still there, disappointing in this long trial, need fathers break thru and His love, visitation , miracle to restore all my kids as a family. wont be same now not married but can have healed healthy loving future relationship with my adult kids. Need hope renewed, answers, release communication with her. God promises vindication and recompense all the enemy stole. Restore honor, double fold He must He is God and never fails. Addition I was layed off my career job in 2012 after 25 yrs for my walk in God, integrity would not compromise. 4 yrs Nothing has opened.Feel it a new journey, and supplying my need only 20% of income I had. Crying out for gods new season in my life His now purpose and direction for my life and blessings above all Ive ever been blessed> A prophetic word /gift and call in my life, spiritual awakening in nation. I pray intercede,cry out to Lord, meditate on word day and night, the Lord reveal himself to me, His voice, what to do, take pain, depression hurt, loneliness away., encouragement. And fill me so deep I never bee the same… All taken from my life. HE must restore all I lost like Elijah the double honor, anointing/restoration of my family please pray for me! Father will rescue you, Javiera. Ask and believe Him in faith. Speak His Word over yourself! His Word will not return void. This word could not have come at a more perfect time….I definitely needed to hear this now, and be reminded of these truths. Feel like a weight has been lifted. So glad to hear that, Joe. Jesus is the great Easer of burdens! So glad this word encouraged you, Tiana. Blessings to you today. Glory to JESUS! Thank you so much Woman of God. Indeed Papa God is using you Mightily. This words came to me when i needed to hear them the Most. I’ve been feeling so broken and worn out nowadays, can’t even spend 10 minutes, i’ve been feeling overwhelmed by exhaustion and all but Glory to God for His perfect timing. Yep!! This is my case too… I was just waiting for the mail. Thank you. WOW! If no one else needed this word, I sure did. It is a direct word from the Lord to me. Thank you for your obedience in sharing it. I am literally at the end of my ropes but I printed this out to constantly read for strength and encouraged. I know this is the enemy on his job but I also know this battle is the Lord’s. I am learning from you how to rest in Him. This is a definite word I can use, I’ve been studying Psalm 91, I hadn’t realized that the word abide also translated as rest. Praise GOD that he has touched your heart as the way to reach out to others that he has placed in your circle of influence and shared his love through you Jamie. Yes, I have a broken Spirit today. I prayed that today, I would start a comeback in my life by the plan that GOD has already prepared for me. May GOD show himself in mine and in all those who share in your ministry as you are sharing with us all. Thank u Big sis?❣for sharing Daddy Gods heart message with us? Luv ya & thank u for your prayers??? Thank you for that word. I was laid off a week ago and I am waiting on God to open the door for my new assignment. This is my 2nd lay off since May 2016. I’m so used to doing something. I know that I must wait and trust Him for instructions. Again, thank you! Jamie your words are like streams in the desert of life, so refreshing! I have had my world ripped out from under me. It’s like a huge wave knocked me off my feet, viciously swirling me around, and I can’t seem to find my footing. My experience was life altering. I know I will never be the same again. I lost my son to suicide one year three months ago! I am devastated and shattered! Father bless you in your service to Him! Thank you Jesus for Jamie .You have no idea what I’m going through but God gave you those words for me.I so needed to hear that . You are a huge blessing . Many Times God has spoke to me through you. Bless you Jamie and your ministry. The source of my “broken spirit” if work-related. I can not understand why and despite of our Dept. head claims to be a “Christian”, her basis in promoting employees is more on “political”. I usually don’t share, but when I was reading your post, it was like God was putting into words what my heart couldn’t. Plain and simple, God confirmed to me. Powerful word! thanks for sharing what God has given you! We can all use an encouraging word because we have all experienced a broken spirit! God is using you in a mighty way you are a great inspiration to all of us!!! Thank you so much, dear Pat. It’s definitely all Jesus. And I love you! So grateful for you. Thank you for your ministry. This blessed me today. God, you are so awesome ! And always on time thank you Father . Thank you woman of God For being such a blessing to me. I have been so overwhelmed, the last couple years have been the hardest in my life, such as I wish I could go back in time and stop on January 15th, which was the last time I remember to be that happy and relaxed. I have been fighting one battle after another, difficult situations that I have never encountered before and I feel shattered. trying to hold on to God as much as I can, but I feel totally exhausted, despaired at times, even struggled with suicide thoughts- I, who would give heart to the others, wanted to end my life as the oppression was so heavy and I did not see any light. One night when I was totally crushed, I felt as the Lord was by the side of my bed saying firmly:” Don’t you dare to take your life” And he called me by name. “I love you! Don’t you dare to think about this again” And another time when I got very sick and I thought I was dying. My blood pressure was very high and I struggled the whole night. I heard as Jesus was praying with me. He was teaching me how to pray. he would say: pray… and say this to your blood.. and I would repeat word after word. I was not awake, not asleep, I can not explain that. And then as I was praying I saw myself before a white door, and I wanted to open it and get on the other side. But the voice told me: don’t go there, don’t open the door, it is not your time yet. I have heard on 2 different occasions when I was very sick in the past few months: Your time has not come yet. I would appreciate your prayers. I feel as the Lord is hidden. I can not relax. My soul is struggling so much, can not rest. Please pray that God will show Himself clearly in my life, in the situations that I am struggling with despair and I will know the truth regarding one situation and will be set free. Thank you! I prayed for you, sister. I am sorry you have been going through a hard time, but it sounds to me like Jesus has been keeping you alive personally! And your life is not over and it’s not wasted. He has WONDERFUL things in store for you! You keep preaching God’s Word of healing to yourself and to your body, and the Lord will raise you up! He always watches over His Word to perform it! I have had a lot come at me. Most of it when you look at it, it is crazy. Not good Jesus crazy….looking about me it is plain absolute from the pits of hell crazy! I have been gulping hard…holding my tongue…trying to wait on God to direct. This morning I sat down and said…Daddy can we talk? Just talk. I am broken and I don’t know how to push through to you. I am not hearing you correctly? If I need correction….please shine your light on it. I don’t want to be in a dark place and I really need your face. But my broken and sad spirit just cried. All I can do right now is cry out. I read this blog right after my prayers and it felt like orders from Headquarters! As soon as I was breaking through I felt like I was supposed to go to my email. And here it was…a promise. A promise that there is a breakthrough coming. I felt guilty for wanting to hide. Can’t witness or help when you hide. I now know that it is ok to hide for the moment…when he slaughters the enemy and the battle has been won, I will rise again. This too will pass…all things will be new. I have been praising through the storm and I will not stop. Again, thank you Jamie for your obedience….I breathe again peacefully. I totally understand, Judy. I have been praying for you. I am sorry that you are going through this, but I am standing with you for Father to work it out for your good. Pastor Ron said Sunday…hold on for another day….and wow a difference a day makes! Answers to so many issues came in one day! My head is still spinning…it is amazing!! Just waiting for funds for a few of the answers…just a number to our God! Praising through the storm is definitely an attention getter for Daddy God!! Now I just have to hold….still at peace…no longer broken! YES! Wonderful news! Papa is so GOOD!!!!!! so obedient and listening to the Holy Spirit with Spiritual ears. This site is such a great blessing. So glad Papa blessed you, Eldona! Thank you for reading. I pray that the precious Holy Spirit of adoption would minister His love to you right now and more than ever, today. In Jesus’ name! God spoke to me. Thank you Jesus! 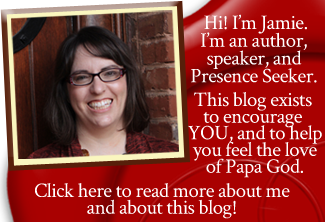 Hi Jamie..thank you for all the encouraging words in your teachings! Brings hope, life, healing.. I made a post here yesterday on my life and what i been going thru for prayer. Apparently it was erased sometime after post. DO you know what happened? I was looking for your reply.. Blessings to you! Hi there. Your comment is ^right up there almot at the top. I am encouraged and received this message when I greatly needed it. I am reminded that my of her is in control. That he loves me, that he has a plan for my good, not my harm. I don’t even know how I found this site, but I am going to accept it as a gift from my heavenly father as a confirmation of what I have been getting from many other sources, thank you sister in Yahshua, I hope that this encourages you, and may all your commenters be blessed. Hi Jamie, thanks so much . Amen to this message. Please how can I do away with having the spirit of ‘ Martha’ that’s always trying to do house chores first before coming to the feet oh Papa just like Mary. I hope you do understand me. God bless you. Hi Freda. I do understand. The way to fix that is simply to realize that Jesus told us to seek God FIRST. Anything less than that is disobedience, which is sin. It’s also idolatry, because it means that other things are more important to us than Jesus–therefore that we have made idols for ourselves out of the other things. The Lord convicted me about this a number of years ago, because I was doing other things before seeking Him too. He convicted me so much that I began to seek Him first, first in the morning before anything else. And that one decision has made all the difference in my life. I pray that Papa would help you do the same thing and to obey Him in all things. <3 Much love in Christ to you, sister. Jamie, yesterday at work, on my break I was reading your email re: a broken spirit. I was so overwhelmed I had to stop reading as tears were coming on strong. Later at home I finished reading all of the comments that were coming in. The greatest healing that can come to all of us is to learn of someone else’s trials and pray for that person. Reading all of the traumas and heartaches so many of us are living with and in the middle of really gave me a strength to take the focus off of me and pray for someone else. Everyday as I go thru this darkness I feel completely alone, I feel like I am the only person on this planet going thru this. I feel like every other child of God is happy and living a wonderful life except me. “Why am I the only one going thru this ugly, tormenting trial? Why am I the only one who has gone thru a painful, heart wrenching divorce, losing my family, friends, my home, my income, my joy? I truly felt ALL ALONE, until I read all the comments posted. As I was reading everyone else’s trauma, a compassion rose up inside me and I hungered to pray for each person. I was so grateful, Jamie, to be able to get a glimpse of another person’s pain. I felt hope rising as I thought of each persons’ hardship and I didn’t feel alone anymore. Thank you so much for praying for our brothers and sisters, Elizabeth. You are truly not alone, and praying for others is one of the best ways to heal. The Lord healed and restored Job when he prayed for his friends. Praying for financial stability and and for work. Wow!, that is amazing timing and what pops out most is “the battle is too strong.”Yes, from every direction, other people’s stuff hitting me and somehow I have become a focal point, in a bad way, Trying to confront makes things worse. I literally could not sit still today. I wanted to just give into an old desire to open my mouth and try to find something to say that would help “fix”things. My attempts only made it worse winding up in a heated argument, with a dearly loved family member. The whole encounter twisted both of us up, boiled over ended , leavings us hurt plus offended. Its fierce. Trying my best to tap out,hide, plus rest. Reading the word but am still a bit jittery wanting to contact and talk it out………weird part is the problems are not mine, but if I say something the whole thing turns on me…..?